I don’t know about you but after this past long, grey and bitterly cold winter I am BEYOND ready for summer and all of it’s associated goodness. I’m talking pimm’s cups, BBQ’s, portable fans that I have to carry throughout the house and of course strawberry shortcake. More specifically this gluten free vegan Strawberry Shortcake. 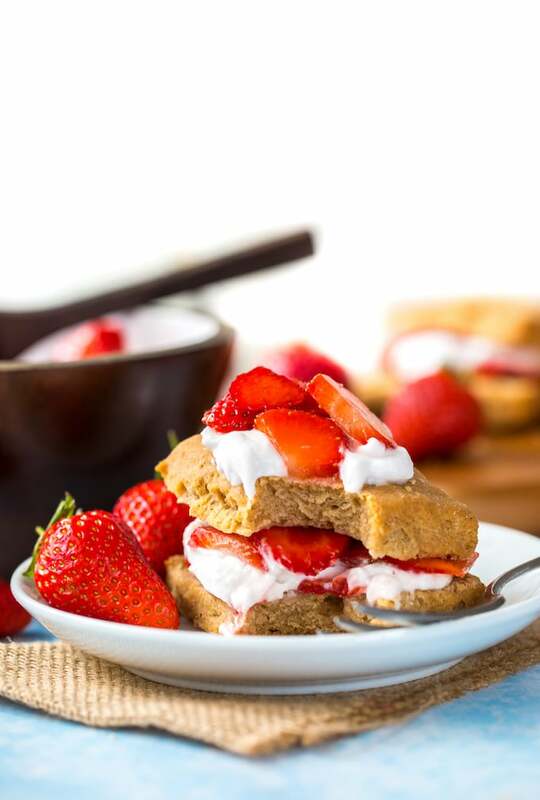 Sweet and tender biscuits stuffed full of soft mounds of coconut whipped cream and juicy macerated strawberries. 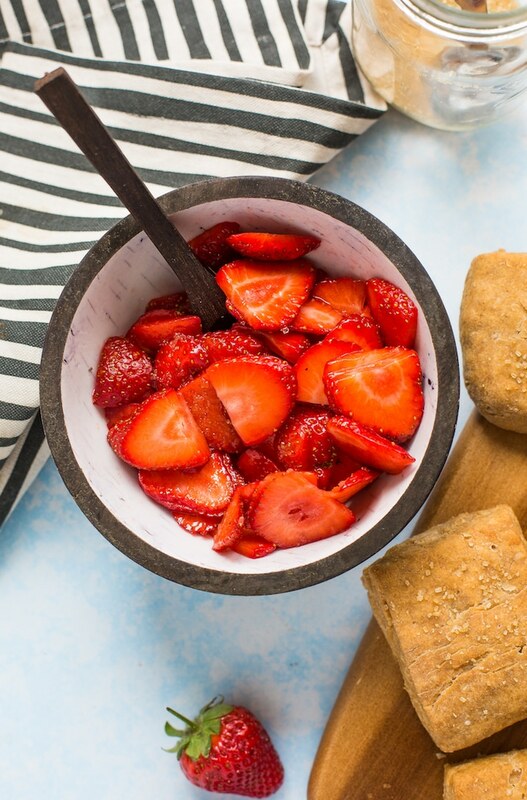 The perfect summer dessert to perfect a perfect summer day. The shortcake here is not too dissimilar from my blueberry scones recipe. They’re super easy to make and only requires six ingredients to make. Full fat coconut milk works best here for softer biscuits. When shaping the dough to cut into small squares, try not to handle the dough/push it down too much. I’ve found that the biscuits end up rising less and becoming more tough after baking the more it gets messed with. As for the rest of the shortcakes there’s not too much to it! All you need is a little bit of whipped cream (coconut if you’re looking to keep this vegan), some strawberries and a little bit of sweetener. Depending on the ripeness/sweetness of your berries you may end up feeling like you want a little more. I recommend two tablespoons to start with but you can always add a touch more if you need. 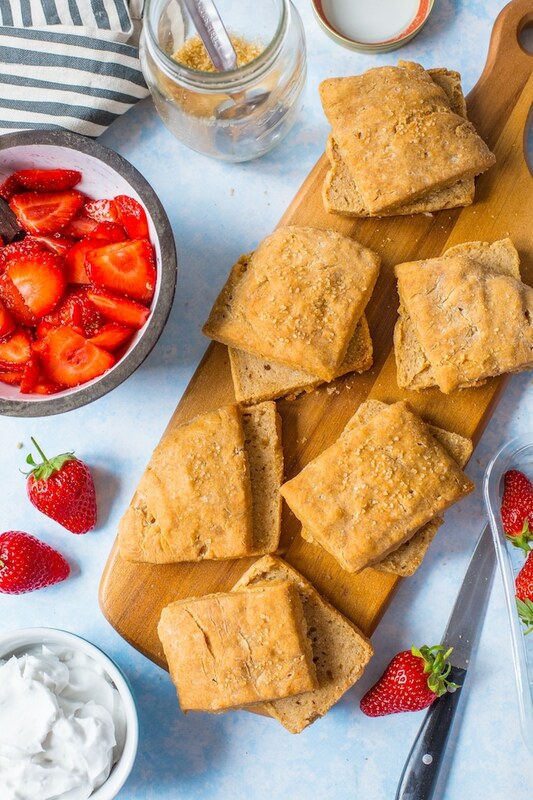 While you biscuit dough is firming up a little bit in the fridge that’s the perfect time to start prepping your berries. This way they have plenty of time to macerate and get all nice and juicy before it’s go time. Like most gluten free baked goods these shortcakes are really lovely the first day you make them. After awhile they start to harden up a bit so if you plan on making this in advance I recommend putting life back into them by heating them up in the microwave for about 20-30 seconds or on a low heat in the oven for a bit. Don’t forget to #asaucykitchen on instagram if you try this Gluten Free Vegan Strawberry Shortcake. I love seeing what you make! You can also post your pictures to my facebook page! 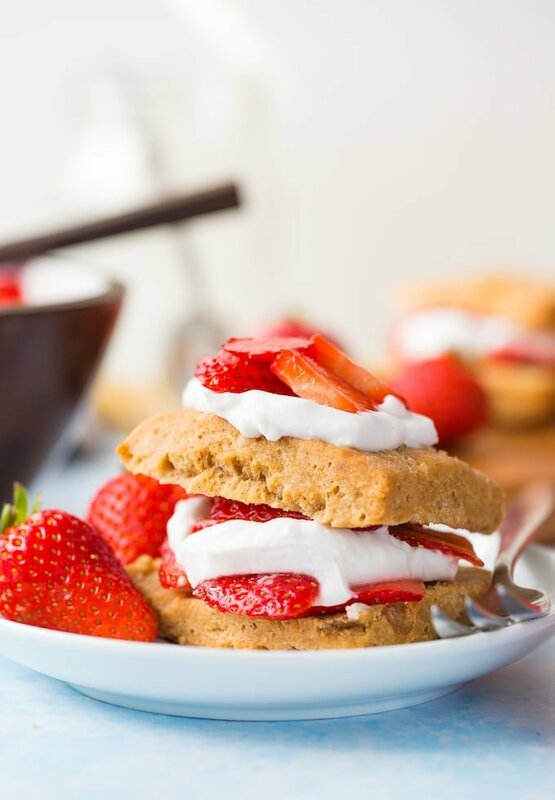 Sweet and simple gluten free vegan Strawberry Shortcakes made with only nine ingredients and mixed together in one bowl. The perfect summer treat! In a large mixing bowl, whisk together the gluten free flour, baking powder, coconut sugar and cinnamon. Add the coconut oil to the dry ingredients and use a fork to mix it into the flour. Mix until the coconut oil is well combined. Your mixture should be powdery & dry. Turn the dough out onto a sheet of lightly floured parchment paper. Gently mould the dough into a rectangular shape, about 7 inches wide and 1 1/2 -2 inches tall. Cut the dough into 8 small squares. Place the dough in the fridge for at least 20 minutes. Don't skip this step - the coconut oil needs to harden up so the scones don't spread too much while baking. While the dough is chilling mix together the strawberries and coconut sugar together in bowl. Cover and refrigerate until needed. Depending on the ripeness/sweetness of your strawberries you may want to add an extra tablespoon or two of sugar. After removing the shortcakes from the oven set aside to let cool for about 10 minutes or so. Once cool enough to handle, slice the shortcakes in half width wise. Spoon the berries on the bottom shortcake. Top with a tablespoon or two of coconut whipped cream, more strawberries and then place the top shortcake layer over the top. Try not to handle the dough too much when shaping & cutting - I've found the more I press and roll the dough the less soft it becomes after baking and doesn't rise nearly as much. I’m sad to say that this recipe ended up being a disaster. We went to the store and purchased all ingredients as listed, except the coconut sugar because they didn’t have any and so we used regular sugar. It’s possible that regular sugar was the issue, so I highly advise future bakers NOT to use it! We took the shortcake out at 20 minutes and it was no where near cooked through (completely done on the outside and raw dough on the inside). We tried 5 more minutes, then 10, then 15 and then gave up with the oven. My husband then tried to microwave them because he didn’t want to waste food and he ultimately ate one because gluten and dairy-free dessert like this is so rare for him. But for me the shortcake was inedible. 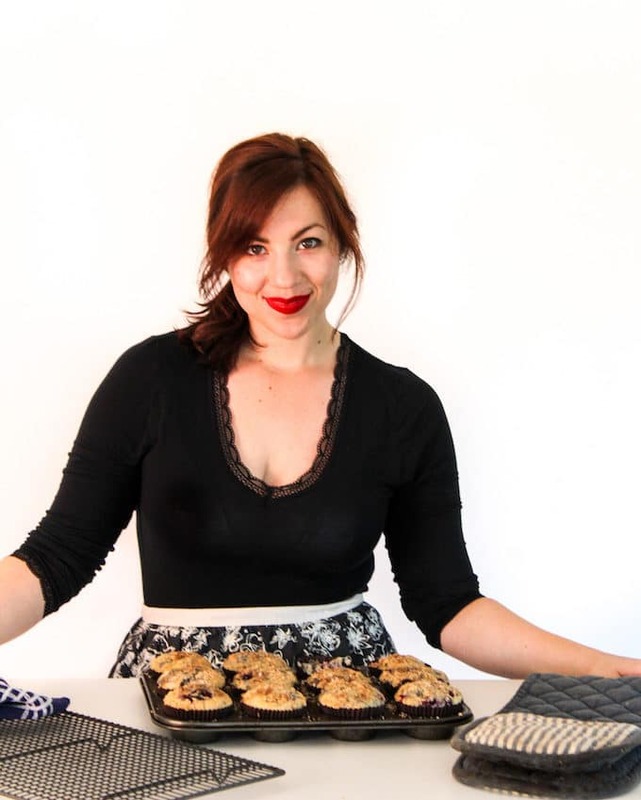 I admit that I am able to eat regular flour and dairy and so it’s always a hard sell for me to try recipes like this to accommodate my husband’s dietary restrictions. I’m completely willing to own the sugar swap as the culprit, but I’d be curious to know how this recipe has worked for others. Sorry I can’t be more help here!